I hope you all had a most wonderful Labor Day Holiday weekend. however, it is still pretty warm here in the beautiful state of North Carolina. Well, at least where I am. 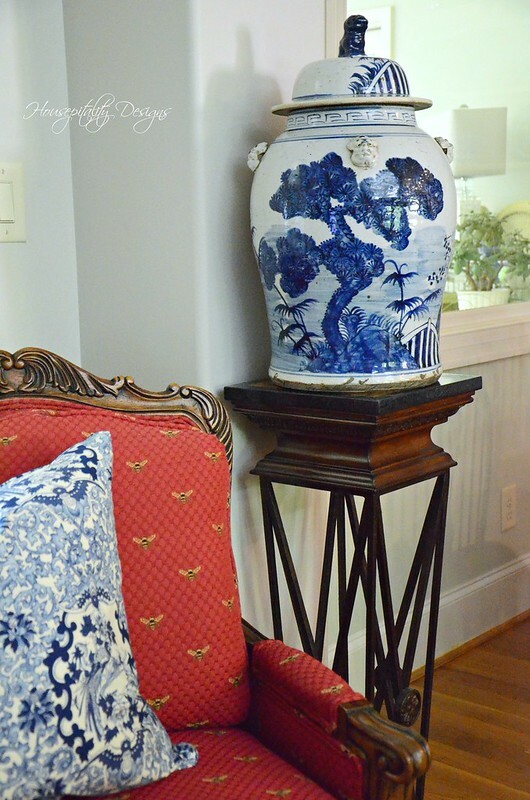 my new sofa decision, Chinoiserie jar and more! I love this grouping shown above. 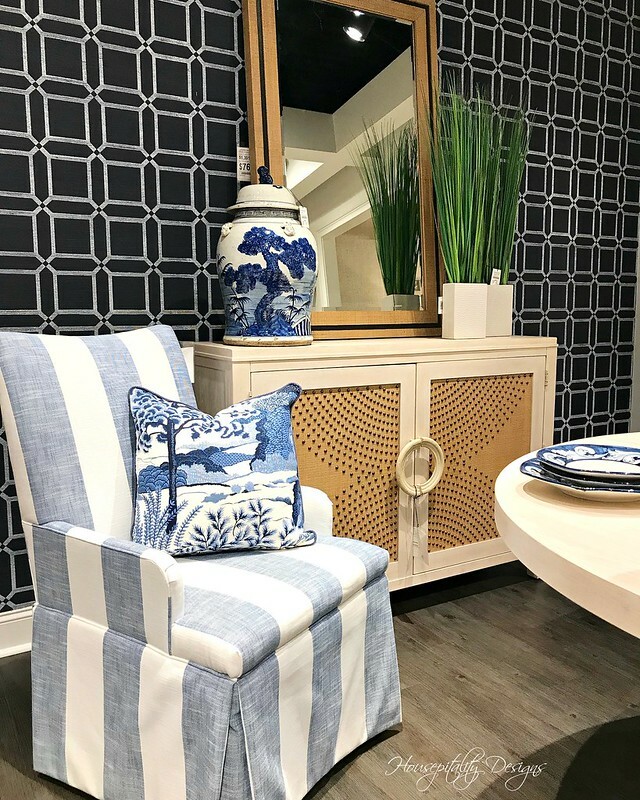 I took this image from the showroom at Furnitureland South in High Point, NC. The Sales Rep and I both looked at each other and smiled. We were off to a great start! But we were on a mission . . . to find a sofa for the new house, as there was a great sale going on. I sold my previous sofa with the table and ottomans to the new owners of my previous home. 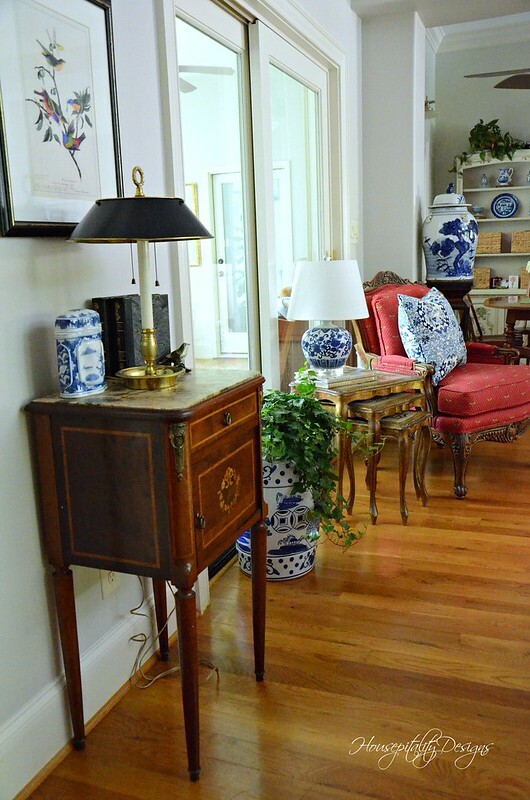 Did you also notice the large Chinoiserie jar on the table in the first image? The one that compliments that fabric so well? It came home with me. . . and here’s the story. however, he kept saying that I should go with the one that “I” loved. I was having a hard time choosing and time was running out as the sale was ending the next day. My hubby had a tournament this past weekend and it was sort of local . . . just an hour away. Our friends came to stay with us over the weekend as they are also a part of the team. Well at least her hubby is . . . and we ladies are the fans. Merry (my friend and guest for the weekend) tagged along. Then we saw another one just like it near the Barclay Butera showroom. and possibly cover a chair. 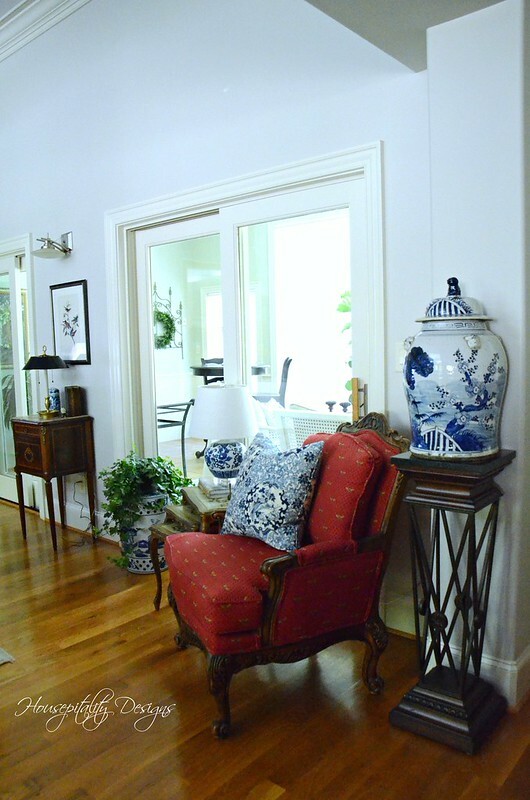 I ordered the furniture and was able to take the jar (by Sarreid) home. So happy that he has a sense of humor! however, this particular scent and name was perfect for the Berry Patch house. that I need to get all of these items as it was the “Berry Patch” collection. 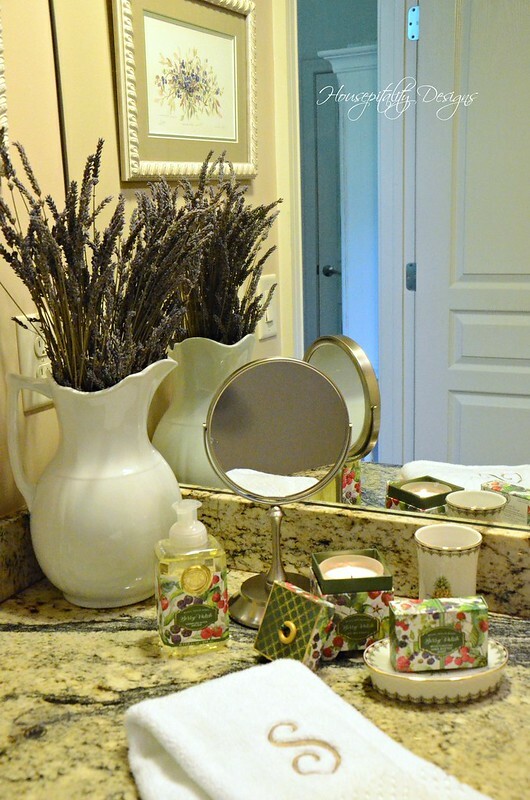 So I bought every item in the Berry Patch collection for the guest bathroom . . . Perfect! two chairs and I will share those later. the back of the sofa caught our eyes. 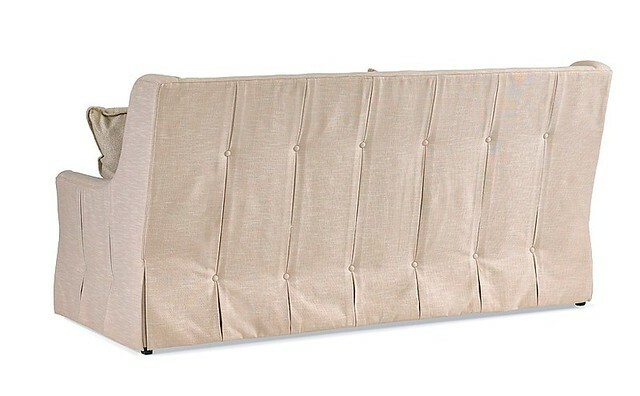 as the back of the sofa will be exposed and most likely be seen when you enter the room. The pleated button design is also on the sides of the sofa. 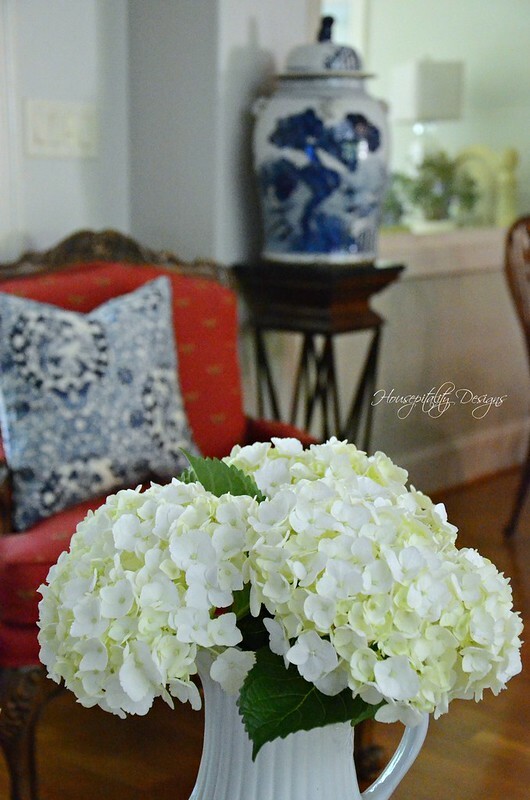 The sofa shown is a pretty blush color….I chose another color. It will take at least 12 weeks to have the sofas made, but worth the wait. Yes, sofas as in two of them . . . I always wanted to have two sofas face each other. SPA National Championship, but rather than show you a photo of the team, here are our fans! Many times we have three generations and sometimes four . . .
of fans cheering on their favorite player and team! A most wonderful group! 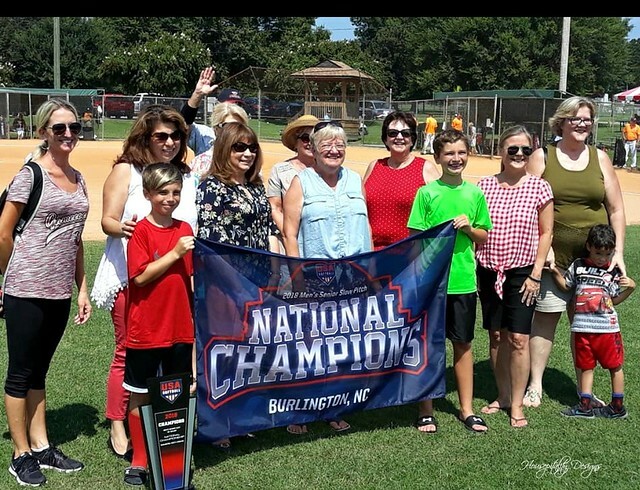 The boys holding the banner are the grandsons of our pitcher…truly a family affair! in which my feet hit the floor! Mary, ( Home is Where the Boat Is) and Pam, (Everyday Living). I love your sofa choice and also that huge jar. Hope Tommy enjoyed his gift! Looking forward to seeing those beautiful sofas in your new home. Shirley, I absolutely love your new sofa choice! 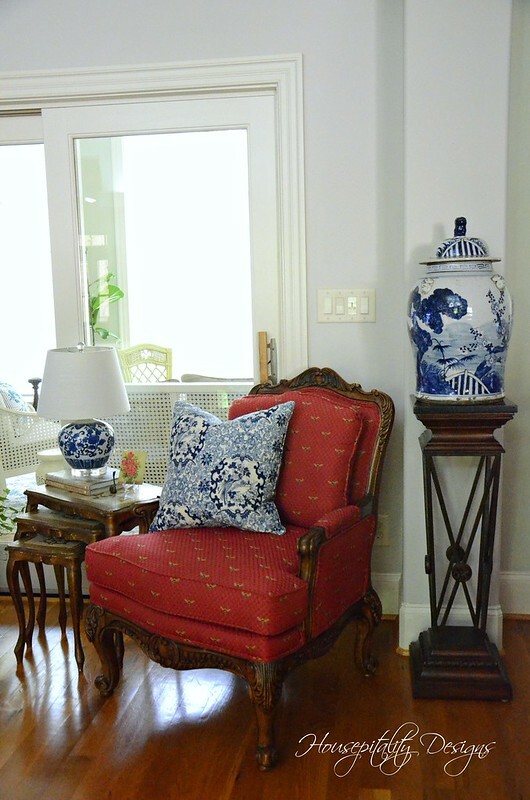 I have two Sherrill chairs and have been very happy with the quality. That ginger jar would have followed me home too! 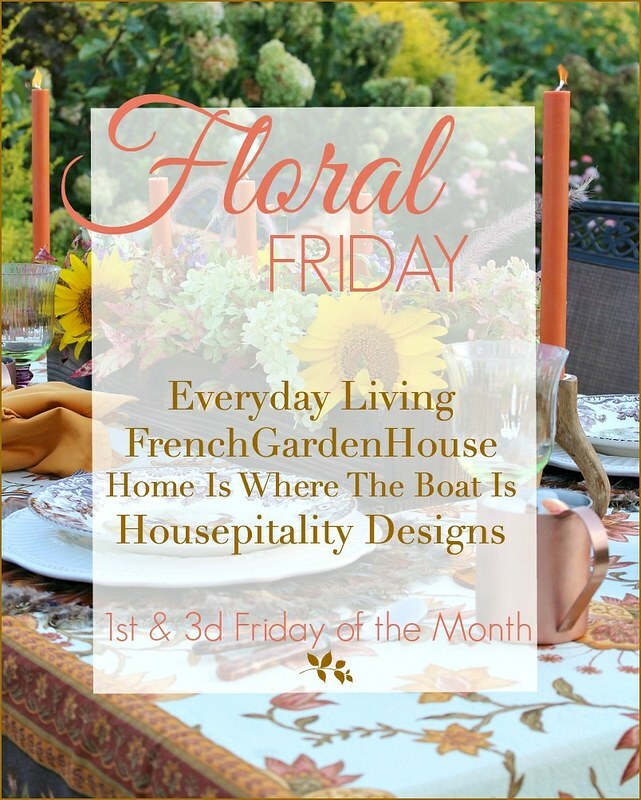 Your new home is going to be beautiful! Happy Tuesday!!! You are having fun and I’m so glad! The gathering on that sofa is amazing! I love those details. The jars are gorgeous too. You are on a roll! Can’t wait to see this come together. I love the sofa(s)!!! Beautiful design. So, what color are you getting???? I ADORE that jar! Hope Tom did too!!! LOL! It is gorgeous. Have a great day. I am decorating for Fall. Slowly but surely, it is coming together. I am itching to go to North Carolina and visit some of those furniture outlets. My mother has A Sherrill sofa and it’s held up beautifully. I like the sofa design you chose- very attractive and designer looking! I always wanted to put a pair of sofas facing each other in my living room too but with a fireplace on one wall and the tv on another it never worked out. I’m sure you are absolutely going to adore them when they come in! The big jar is an awesome piece. I 100% approve of the sofa selection!!! And the jar is perfection! Such an exciting time! Love, Love, LOVE the sofas!! Love the style of the sofas!! Love the tailored detail on the sofa, Shirley. 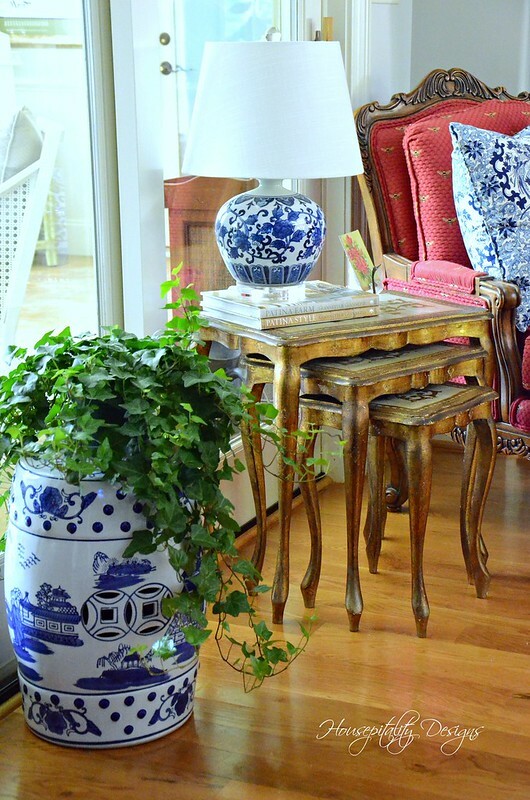 The Chinoiserie pieces are also wonderful. 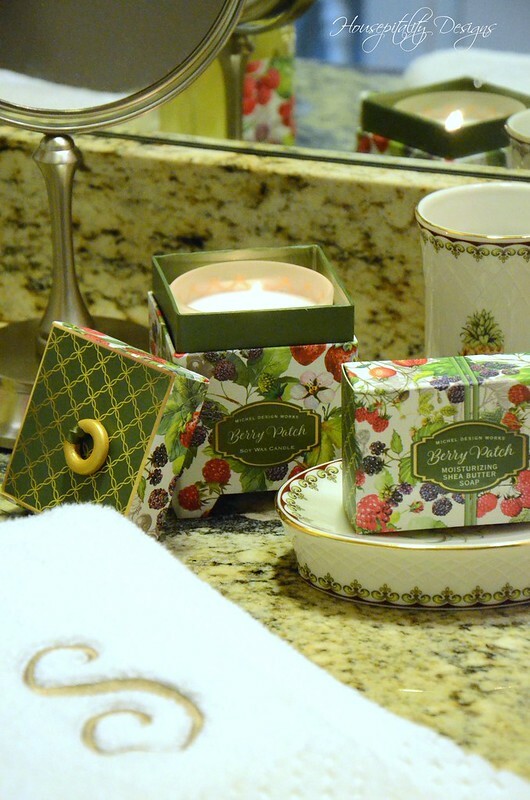 Berry Patch ath products….how perfect. 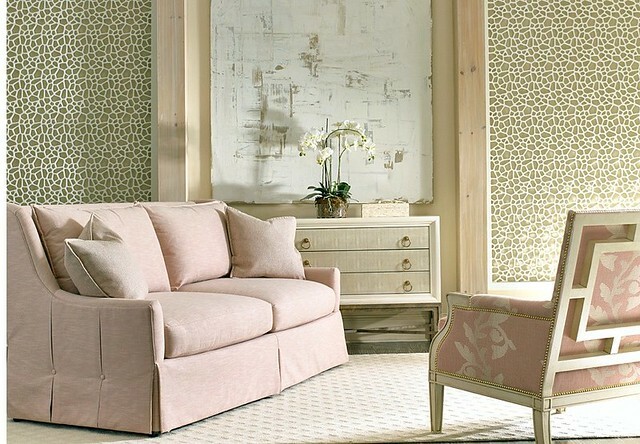 The sofa style is GORGEOUS!! I am sure you will love the finished products!! I love the details on the sofa. What a beautiful choice. Shirley, I absolutely love the sofa, such a beautiful choice especially with the stunning details. The jars are fabulous! Congrats to the hubby and his team. See you Friday! Beautiful sofas with pretty details. Blue and white is always right! I live in Brunswick, GA so I am always excited to shop on St Simons. Those products for the Berry Patch bath are perfect. There are a lot of lovely fragrances to choose from. Can’t wait to see your new home progress. The sofa couldn’t be more perfect Shirley! We were going with two sofas also, but when they arrived they looked a bit large for the tiny space so we sent them back and started over. We ended up with one sofa that arrived last week and thankfully we love it. If we had the space I would definitely go with two sofas facing each other. It’s such a classic and elegant look and perfect for conversation. The detailing on the back is very similar to my ‘Carol Lombard’ sofa, which is in the sitting room adjacent to the master bedroom. Unfortunately the back isn’t visible which defeats the purpose but it’s nice to know it’s there :). Ha! Still that jar WAS a birthday gift for your husband because it will help create a calm, beautiful environment for him to come home to each night. So there’s that! And that sofa is. To. Die. For!!!!!!!!!!!!! You have such enviable good taste!! !